2013 Lady Trophy Winners - Jenny Cordon, Dorothie Cowburn, Lisa Davies, Jo Peacock, Sheila Woolley, Gill Armstrong, Joy Briggs, Karen Wilshaw and Janet Gilbert. 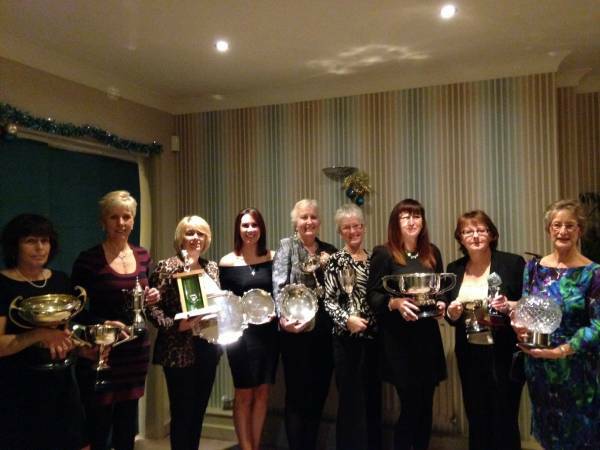 On December 3rd our 2013 Lady Captain Marilyn Boulton welcomed 70 ladies to our annual Christmas Dinner. A good time was had by all. Good food, good company, what more could we ask for. The meal was followed by the presentations for the medals and trophies which were played for throughout the year. After a talk on the Philippine disaster by the Lady Vice Captain Jayne Baxter, a collection was raised over a very healthy £300. Marilyn finalised the evening by wishing all the ladies a Happy Christmas and all the best for the coming new year.